Another type of biometric scan can be done to identify the dorsal venous network of the hand. 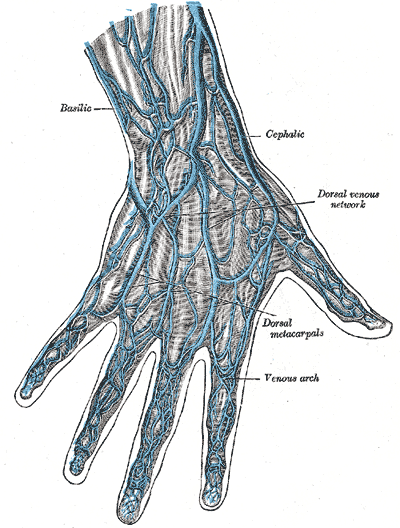 This essentially shows the blood vessels on the back of the hand and may be another useful factor for verification. Hand geometry is not a unique form of biometric security. More than one person may have the same or very similar hand shapes. This limits the usefulness of hand geometry to verification, not identification. Combining hand geometry with another form of biometric security, such as fingerprint biometrics, would provide a very secure identification system. A system where hand geometry was used to verify the fingerprint input would add an additional layer of security and create a very effective identification system. Implementing a security system based on hand geometry alone would not be a viable security system, however when combined with fingerprint biometrics it is a suitable security system for almost any business need. 1. Hand Geometry. Michigan State University. 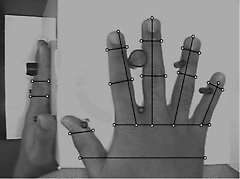 http://biometrics.cse.msu.edu/hand_geometry.html. Retrieved 4/2/08. 2. An Introduction to Biometrics - Hand Geometry Recognition. The RNIB Scientific Research Unit. 2008. http://www.tiresias.org/guidelines/biometrics_hand.htm. Retrieved 4/2/08. 3. Hand Geometry Projects. Michigan State University. http://biometrics.cse.msu.edu/hand_proto.html. Retrieved 4/2/08. 4. Biometrics-based Web Access. Michigan State University. 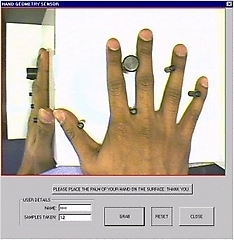 http://biometrics.cse.msu.edu/hand_web.html. Retrieved 4/2/08. 5. Hand Geometry and Handwriting. GlobalSecurity.org. 2007. http://www.globalsecurity.org/security/systems/biometrics-hand.htm. Retrieved 4/2/2008.